The next time you're rushing out of the Saint-Paul métro station (Line 1) on your way to the Place des Vosges in the Marais, take a moment to admire the rare Val d'Osne signpost. The luminous opaline globe was created in the 1920s to better illuminate the metro entrance. 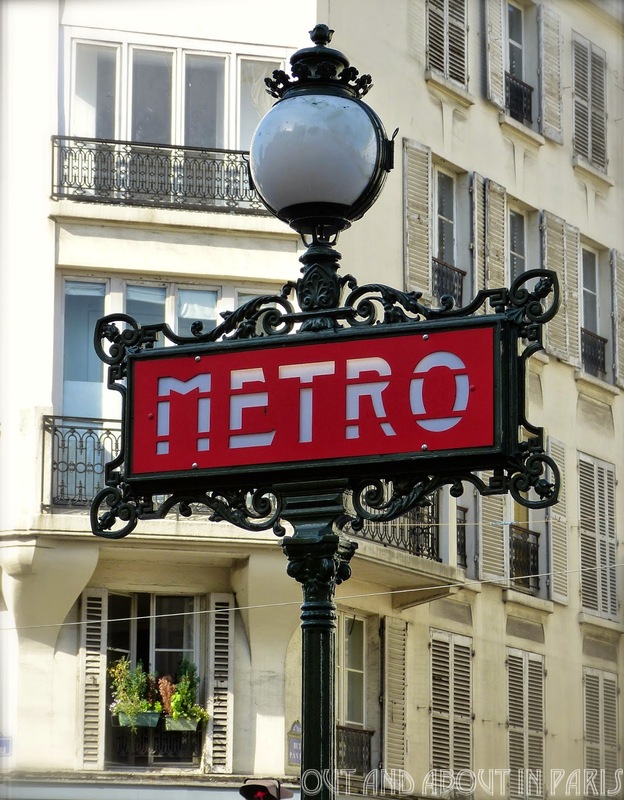 An ornate cast-iron frieze frames the word MÉTRO. The font used for the abbreviated form of Métropolitain is remarkably different from Hector Guimard's Art Nouveau signage of the early 1900s. Named after the iron foundry that manufactured them, the Val d'Osne totems were followed by the Art Deco Dervaux signposts in 1924. Those totems, created by architect Adolphe Dervaux, illustrate the trend away from elaborate decorative embellishments. 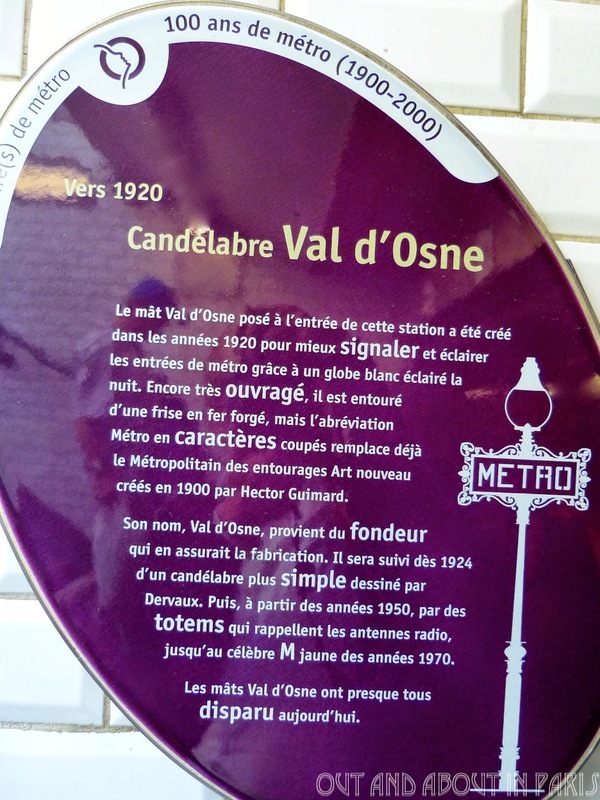 With more than 300 metro stations in Paris, spotting a Val d'Osne signpost is like finding a needle in a haystack. During the next couple of months, I'm going to see how many I can locate. If you come across one, please let me know! 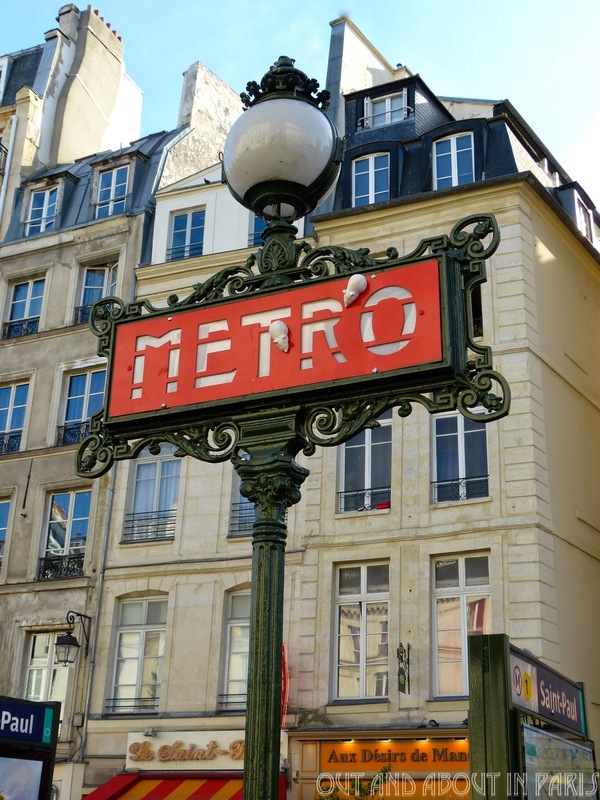 Interesting tidbit via France.fr: The Paris metro is the only one to have offered a choice of two classes on its network. The "first class" service existed until 1982. After this date, the principal of first class was restricted to rush hours (from 9 am to 5 pm) and people with disabilities and pregnant women were allowed access to first class at all times. A single class system has been in place since 1991. Click here to listen to a fascinating NPR podcast with Mark Ovenden, co-author of the book Paris Underground. I remember being shooed out of a first class metro car on a visit to Paris in the mid 1980s. Keep us "posted" on the signs. I wish I would have been shooed out of a first class metro car during my first visit to Paris in 1981 because then I would remember them! The only ones that I remember from that visit are 2nd class ones, which seemed like they cost a fortune on my backpacker's budget. I spotted another Val d'Osne sign at Michel-Ange Auteuil. Unfortunately, I was in a hurry and didn't have time to take a photo. Thanks, Nancy! I agree that it would be helpful if the information signs were in French and English. Be sure to check out the book "Paris by Plaque". It has English translations of the signs in Montmartre. Any idea as to how many of these there are? It would be fun to go on a hunt for them! I don't think they lasted until 1982 though! Gwan, aka super internet sleuth, thanks for posting the link for the BBC article. I was also surprised by France.fr's claim that Parisian metros were the only ones to have two classes. There's another Val d'Osne candelabra sign at Saint-Germain-des-Près. Karen, Thanks for the heads up about the Val d'Osne candelabra sign at Saint-Germain-des-Près. I'll have to take a photo of it the next time I'm there. The World's Oldest Basketball Court is in Paris!